The 4th session of the 13th Supreme People’s Assembly (SPA), the DPRK’s rubber-stamp unicameral legislative body, replaced the country’s supreme power organization at its June 29 meeting. While underscoring the ruling party’s control over state and military affairs and further consolidating Kim Jong Un’s authority, the development proved that North Korea doesn’t play by C-SPAN rules. Pyongyang watchers who bemoaned the lack of technical policy details revealed at the 7th Congress of the Workers’ Party of Korea (WPK) in May—particularly in light of Kim Jong Un’s newly announced Five Year Strategy of State Economic Development—should have taken a breath, awaited the publication of Kim’s full report to the Party Congress, and watched for the (relatively) more substantive developments and reporting from this latest SPA session. Figure 1. 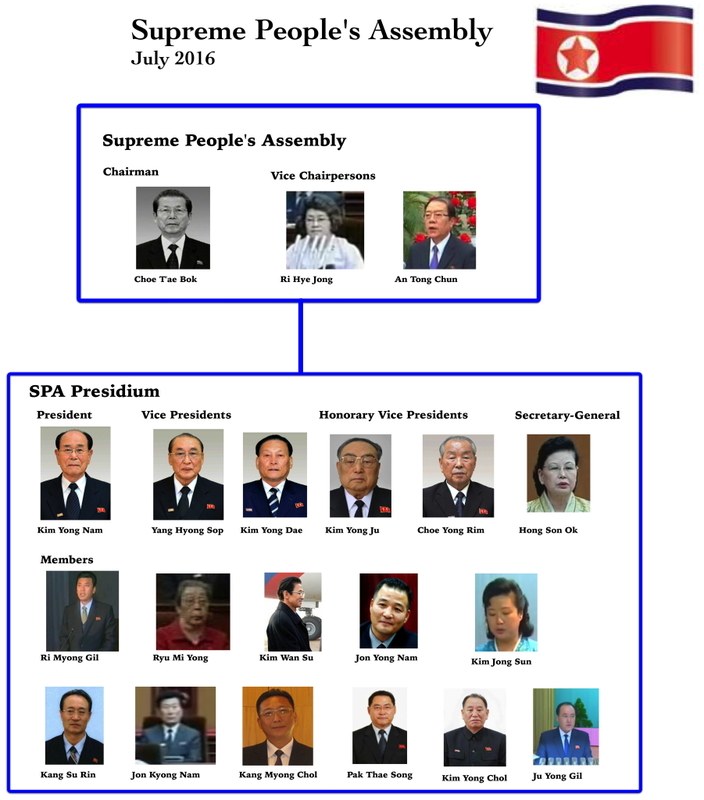 Leadership of the Supreme People’s Assembly. Chart: Michael Madden/NK Leadership Watch. On June 29, the SPA established the State Affairs Commission (SAC)—replacing its predecessor, the National Defense Commission (NDC)—and appointed Kim Jong Un as the new organization’s Chairman. A lot of preliminary reporting and analysis has focused on the establishment of the SAC and the creation of the SAC Chairman position as one act, but in truth, the SPA did two things. First, it amended Section 2 of the DPRK Constitution to create the SAC chairmanship and awarded the position to Kim Jong Un, replacing his old title of NDC First Chairman. Second, it amended Section 3 of the DPRK Constitution which prescribes the authority and duties of the DPRK government’s supreme power organization, to replace the NDC with the SAC. With these changes, the SAC also now has the bureaucratic apparatus (a collection of departments and sections) that previously existed under the NDC. The NDC had served as the country’s supreme leadership body since 1998 and outlived its organizational life cycle. It was no longer needed to support the late Kim Jong Il’s opaque leadership style, implement the songun (military first) revolutionary line or support decision-making related to crisis management and transition. Much like the April 2012 speech that Kim Jong Un gave to commemorate his grandfather’s 100th birth anniversary, the SAC’s creation is intended to signal that the DPRK has attained sufficient progress in its development of nuclear weapons, space programs and conventional arms production that resources and attention can shift to (or at least share co-billing with) domestic economic development. With the introduction of the byungjin (dual development of nuclear weapons and the economy) revolutionary line under Kim Jong Un, the leadership normalized the policy and personnel associated with weapons of mass destruction and space development, which until then had been ad-hoc processes. Research and production organizations migrated back to their original WPK control, while research, administration and resource allocation shifted to the DPRK Cabinet. Unlike its predecessor organization, the SAC at least superficially prioritizes “state affairs” over “national defense.” With the exception of chartering a state development bank and trading corporation, much of the NDC’s observed public activity was issuing statements about South Korean military exercises and the personnel affairs of senior DPRK security officials. Organizationally, with regard to state affairs, the NDC provided an institutional link between the military and the DPRK Cabinet. The new body contains more senior officials from the WPK and the DPRK government, and it has proportionally fewer representatives of the military and national security communities, though half of the SAC’s members still come from the Korean People’s Army (KPA) and the internal security services. Rather than fully sweeping out the top leadership, the SPA (and Kim Jong Un) ended the military’s dominance by introducing more officials from elsewhere. Together, the SAC and Kim Jong Un’s new title represent an institutional hybrid of the NDC and the old Central People’s Committee that the NDC replaced in 1998. Meanwhile, the SAC will continue the NDC’s command and control of North Korean armed forces and internal security agencies, sharing the responsibility jointly with the WPK Central Military Commission (CMC). Aside from national security policy, the SAC will be involved in determining foreign policy, with its inclusion of WPK Vice Chairman and Director of the WPK International Affairs Department Ri Su Yong and Foreign Minister Ri Yong Ho. The new body will help formulate and promulgate macro-foreign policies, but it remains to be seen if it will be involved in appointing Foreign Ministry or diplomatic personnel (an authority currently held by the SPA and the SPA Presidium, but previously held by the Central People’s Committee). Figure 3. Basic structure of the DPRK Government after the SPA session. The SAC represents a shift back to the WPK’s control over state and military affairs. 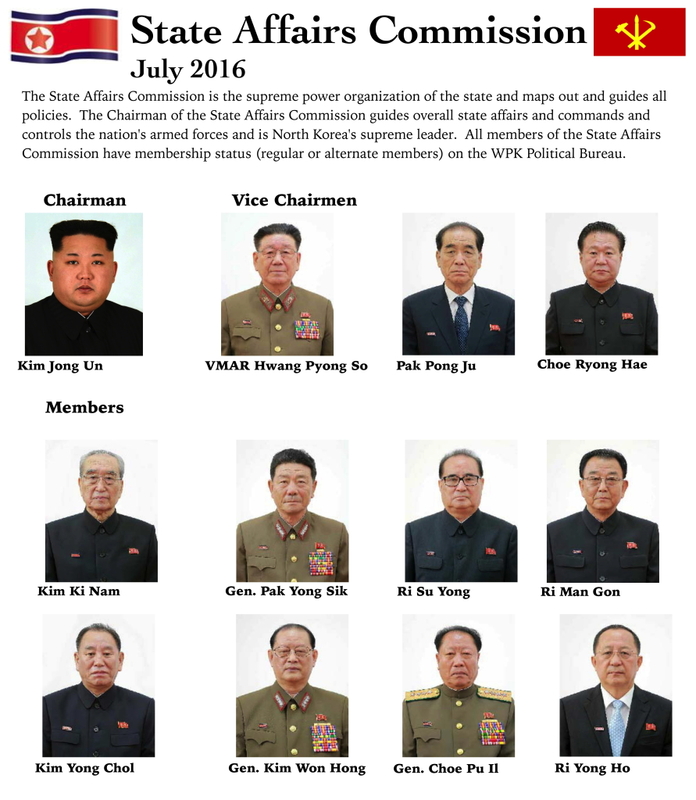 All of the SAC’s Vice Chairmen and members are also members of the WPK Political Bureau, and all but one are also members of either or both the CMC or the WPK Executive Policy Council. The overlapping roles of the SAC’s members create an unambiguous link and control channel from the Party to the KPA and state, addressing the dispersal of senior officials throughout top power organizations that had left room for competition within the leadership. Back in 2010, the DPRK’s unofficial second-in-command, Jang Song Thaek, controlled much of the regime’s daily grind as an NDC Vice Chairman and director of the WPK Administration Department. However, he was not a WPK Secretary (now called a WPK Vice Chairman) and only had alternate member status on the Political Bureau. This created a loophole and grey area that allowed Jang to create a fiefdom that he refused to surrender. Similarly, from 2010 to 2015, top officials of the WPK Munitions Industry Department were located all over the bureaucracy. The Chairman of the Second Economic Committee, who directs manufacturing of conventional and advanced arms, was an NDC Member but not a part of the Political Bureau. Also on the NDC were the WPK Secretary for Munitions Industry and the Director of the WPK Munitions Industry Department, two different office holders who had Political Bureau status. These statuses represented a power cleavage of overlapping authority and divided those involved in research and development; production and manufacturing; and policy formulation and execution. After the 7th Party Congress and 4th SPA session, all of these state and party positions are now held by one man, Ri Man Gon, eliminating administrative redundancies and bureaucratic turf wars. Does the SAC provide institutional cover through which Kim Jong Un will more readily interact with foreign delegations that visit Pyongyang? Kim Il Sung received foreign delegations in his capacity as DPRK President, something that Kim Jong Il tried avoid as NDC Chairman. Will the SAC, like the NDC before it, behave opaquely? And to that effect will there be occasional public meetings or gatherings of the SAC, similar to Political Bureau and CMC meetings that have taken place under Kim Jong Un? Will the new body issue public decisions and directives or issue instructions or guidelines for the substantive policy process in Pyongyang? Will the SAC, like the NDC before it, participate in personnel matters and occasionally publicize them in state media? The SAC will assume partial oversight, and has likely claimed ultimate responsibility, for Kim Jong Un’s Five Year Strategy for State Economic Development. However, it would be wrong to interpret its creation solely as a step to implement this plan. DPRK Premier Pak Pong Ju is the only SAC member whose sole policy portfolio is economic affairs, underscoring his position in the driver’s seat of North Korea’s economy. Ri Ju O was the Minister of Light Industry for much of the 2000s. Ri’s appointment signals that some DPRK economic policies will focus on the production of consumer goods. Ri Ryong Nam has over two decades of experience as a trade representative and has served since 2008 as Minister of External Economic Relations. Ri’s appointment means that, despite sanctions, the DPRK will build on its current foreign trade relationships while trying to make new ones. Ko In Ho was appointed, concurrently, DPRK Vice Premier and Minister of Agriculture. During the early to mid-2000s, Ko served as a vice chairman and chairman of the Pyongyang Rural Management Committee. Ko possesses solid experience in the rural management system and deep understanding of the North’s agricultural sector. There are some commonalities in these three personnel appointments. All three of these men are experienced working-level officials with some idea as to what policies and execution methods will be effective. Also, they have prior experience dealing with international interlocutors and were in influential positions when the July 2002 reforms were implemented. The latest SPA session also instituted several economic policy revisions teased at the 7th Party Congress, confirming that the May event established an organizational framework through which the WPK and DPRK Cabinet can implement policies. Among these changes, the WPK revived the Economic Affairs Department, which had been moribund due to the 2005 establishment of the WPK Planning and Finance Department and the disappearance (due to old age and physical infirmity) of its incumbent director. The WPK also spun off the WPK Agriculture Department from the Planning and Finance Department, which had assumed control of the office in 2005. Figure 4. 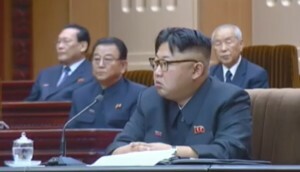 Kim Jong Un at the 4th session of the 13th SPA. Behind him (left to right) are Kim Yong Dae, Ri Man Gon and Choe Yong Rim. Figure 5. Vice Marshal Ri Yong Mu and General O Kuk Ryol (front row) attend the 4th session of the 13th SPA on June 29, 2016. Four senior DPRK officials with longstanding ties to late leader Kim Jong Il have been transferred to “other posts” or retired from office. Two of the retirees were Vice Marshal Ri Yong Mu and General O Kuk Ryol, two former NDC senior vice chairmen who had been removed from the WPK Political Bureau during the 7th Party Congress. Now, their state positions at the top of the NDC seemingly have been abolished. Also cycled out from the DPRK leadership was Tae Jong Su, a technocrat and DPRK Cabinet Vice Premier who served as the party’s boss in South Hamgyong Province since 2012. Tae was removed from the SPA Presidium and replaced with three senior officials tied to Kim Jong Un. Pak Myong Chol was removed as head of the DPRK Central Court, an office that for two years had made him head of the DPRK court system. He was replaced by Kang Yun Sok, a DPRK attorney who has served for several years as Director-General of the SPA Legislation Department and was Chairman of the DPRK Coordinating Committee for the Implementation of the UN Convention of the Rights of the Child. 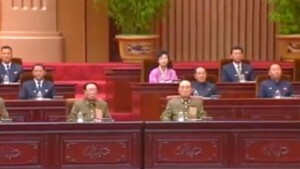 All four of these DPRK leadership elders remain members of the WPK Central Committee. There is a good chance that the regime is keeping them around because Kim Jong Un, and other members of their core leadership, may need their extensive career experience and advice going forward. Kim Jong Un has probably wanted to modify the NDC for some time. As when he dropped the title of “WPK First Secretary” to become WPK Chairman at the 7th Party Congress, Kim freed himself of another awkward, improvised title (“NDC First Chairman”) when he became SAC Chairman in June. Socialist Constitution of the Democratic People’s Republic of Korea (Pyongyang, Foreign Publishing House, 2014); “Socialist Constitution of the Democratic People’s Republic of Korea,” Naewoe Tongsin (in Korean), November 26, 1992. According to DPRK state media reporting, these changes to the DPRK Constitution essentially clarified the NDC’s previous powers over domestic and national security policies as proscribed in Section 2 and Section 3 of the DPRK Constitution. The letter of the law was always ambiguous in this regard. Article 103 (“directs overall state affairs”) and Article 109 (“maps out important policies”) never provided an explicit line of authority linking the NDC to the DPRK Cabinet, which oversees economic affairs. Yet the spirit of the law, when practiced, clearly tied the NDC’s power to state economic organs. This was clearly seen at the Korea Taepung International Investment Group’s first board meeting in early 2010, where participants read out decisions of the NDC and NDC Chairman. One year later, in announcing a state economic development strategy, the link between the NDC, the state economic organizations and Taepung was implicitly drawn when the DPRK Cabinet set up the State General Bureau, in line with Taepung’s charter by the NDC. See “1st Meeting of Korea Taepung IIG Held,” KCNA, January 20, 2010; “DPRK Establishes the State Bureau for Economic Development,” NK Economy Watch, January 16, 2011. Pyongyang watchers have sounded the death knell for the National Defense Commission for over a decade, based on the call-out order of NDC Members in state media back in the mid-2000s. This highlights how call-out order/platform analysis can yield misleading interpretations about DPRK political culture. From 2007 to 2009, the DPRK defied the platform pundits. First, it made the NDC a permanent state organization by creating a series of subordinate NDC departments. Then in 2009, it expanded the NDC’s constitutional authority and legal powers. Ken Gause, North Korea Under Kim Chong-il (Santa Monica: Praeger, 2011); Ken Gause, Scenarios and Signposts (Center for Naval Analyses, 2009). There were already telltale signs that the NDC would not last much longer. Former WPK Munitions Industry Department Director Kim Chun Sop, an NDC Member removed from office in November 2015, was not replaced by his MID successor Ri Man Gon either by the SPA Presidium or by a separate NDC order. Also, the NDC’s two senior vice chairmen, Vice Marshal Ri Yong Mu and General O Kuk Ryol, were dismissed from the WPK Political Bureau during the 7th Party Congress in May. The NDC has been misunderstood and misinterpreted as a military body concerned only with defense and national security policies. In 2009, the NDC’s authority was expanded to include economic and foreign policies. It always was the supreme power organization of the state, not the military; the body’s Vice Chairman and Members just happened to be drawn from the senior echelon of the Korean People’s Army (KPA) and the DPRK national security community. The SPA also overhauled Article 109; while the final language has yet to be released, it in all likelihood alters the stipulation that the NDC “map[s] out important policies of the state for carrying out the So’ngun (military-first) revolutionary line.” Speculatively, the SPA replaced “So’ngun” with “pyongjin,” the dual ideological line of developing nuclear deterrence and the domestic economy. In terms of national security and domestic policy, the SAC codifies how Kim Jong Un will practice the monolithic leadership system: leveraging powers from the old NDC system of Kim Jong Il and the even older Central People’s Committee system of Kim Il Sung. Previously, the NDC and CMC jointly exercised these powers over the KPA and internal security apparatus. These members include one alternate. The clearest connection is between the SAC and the WPK Executive Policy Council, in which relevant Party vice chairmen and Party department directors will approve, formulate and execute policies implemented through the state and security institutions to which they are linked. The established links established run from the WPK Political Bureau (Party political policy control and supreme authority on behalf of the WPK Central Committee), WPK Vice Chairman and the WPK Executive Policy Council (policy approval and formulation), the WPK CMC (national security policy and personnel control) and WPK department directors (daily operational management, administration and personnel controls). Alexandre Mansourov. “North Korea Leadership Schisms and Consolidations During Kim Jong Un’s Second Year in Power.” 38 North, January 22, 2014. https://www.38north.org/2014/01/amansourov012214/. This applied to both Second Economic Committee Chairman Paek Se Bong and Jo Chun Ryong. In this case, the officials were former WPK Secretary Pak To Chun and former WPK Munitions Industry Department Director Ju Kyu Chang. A third question, albeit academic, is whether the core leadership has used the SAC on a trial basis and the SPA session merely institutionalized a power arrangement that the DPRK core leadership has been trying as a pilot program with select policies. In any case, the Party will continue to issue and/or approve policies implemented by government ministries, agencies and institutions. During the SPA session, Pak Pong Ju delivered a report that alluded to Kim Jong Un’s five-year strategy on economic development. He said the strategy is “aimed to reenergize the overall national economy and keep the balance among economic sectors and thus lay a foundation for ensuring sustained development of the country’s economy.” The supporting speeches at the session reportedly “expressed … determination to attain the goals of the five-year strategy for national economic development without fail, saying that the strategy serves as a scientific and revolutionary one for bringing about a great surge in building an economic power in line with the law-governed requires of socialist economic construction and realistic conditions and blueprint indicating a shortcut to the building of a socialist power.” The remarks were delivered by Minister of Electronic Power Kim Man Su, DPRK Vice Premier and Minister of Chemical Industry Ri Mu Yong, Hwanghae Iron and Steel Complex head Kim Chung Gol, Director of the WPK Agriculture Department Ri Chol Man and Pyongyang WPK City Committee Chairman Kim Su Gil. Policy details are most likely being communicated internally to avoid the scrutiny and analysis of external observers. If a policy doesn’t have the desired outcome, Pyongyang neither needs nor wants an external critique about its domestic affairs. Ri Ju O was appointed Vice Minister of Machine-Building Industry in 1998, Vice Minister of Light Industry in 2001 and elevated to Minister within a year. He held the position until the 3rd session of the 12th SPA held on June 7, 2010 when he was replaced by An Jong Su, who is currently the director of the WPK Light Industry Department. Even after he was removed from office in June 2010, Ri continued to attend national events, indicating he had not been completely disappeared from public life. Ri Ryong Nam was appointed Minister of Foreign Trade in 2008. During the early 1990s he served as diplomatic secretary for trade at the DPRK’s Embassy in Singapore. Since 1998 he has worked at Ministry of Foreign Trade in Pyongyang in a series of successive positions, serving under both Ri Kwang Gun and Rim Kyong Man. His experience traveling abroad representing the DPRK is extensive. In what can only be a strange coincidence, Ri Ju O and Ri Ryong Nam were listed sequentially on the state funeral committee for Pak Song Chol in October 2008. The last 20 years of DPRK history have seen at least two major consolidations of the WPK Central Committee’s departments involved in economic policies and planning. In 1993, the WPK Planning Department and the WPK Light Industry Departments were consolidated under the WPK Economic Policy Inspection Department which was led by Kim Kyong Hui (Kim Jong Un’s aunt and Jang Song Thaek’s widow) whose primary deputy was current DPRK Premier Pak Pong Ju. In 1997, this department disbanded with the consolidated departments reverting back to their own institutions. The current director of the WPK Economic Affairs Department is O Su Yong, who is also a WPK Vice Chairman and Member of the Political Bureau. In 2014, O was appointed WPK Secretary but his portfolio was never explicitly disclosed. As far back as 2013, there were rumors that a new “Department of the Economy” would take precedence over the WPK’s other economic departments in shaping macroeconomic policies. State media reporting on the 7th Party Congress and the observed activities of DPRK elites partially corroborated these 3-year-old rumors. See Sung Hui Moon. “North Korea’s Workers’ Party Takes Economic Control.” Radio Free Asia, July 12, 2013. http://www.rfa.org/english/news/korea/economy-07122013154816.html. In 2005, Party ideologues represented by Pak Nam Gi struck back at Kim Jong Il’s “new thinking” and the July 2002 Economic Measures, which modified North Korea’s economic policies. The resulting WPK Planning and Finance Department, which Pak directed, consolidated the WPK Planning Department and the WPK Agriculture Department along with sections of the WPK Economic Policy Inspection Department and the WPK Finance and Accounting Department. Pak Nam Gi, who would be shot to death in February 2010 for a botched currency swap, also supervised a corporate downsizing of the WPK Central Committee. Some party cadres and staff were laid off while others migrated to other positions in the National Defense Commission. Any assessment of the newly established SAC should always bear in mind that the NDC’s bureaucracy was once boosted to the detriment of the WPK Central Committee apparatus, causing a lot of people to lose their jobs. The last known director, who was concurrently a WPK Secretary, was Han Song Ryol. Han has not appeared in DPRK state media in almost ten years. This is the first noticeable policy that Kim Yong Chol has implemented since he took over the inter-Korean portfolio as head of the WPK United Front Department in January of this year that was not the old business of his predecessor. Vice Marshal Ri is 90 years old and was one of the oldest active members of the DPRK leadership. The Kim family cousin served during the 1970s as director of the KPA General Political Department. Earlier in June, neither Vice Marshal Ri nor General O appeared at the central report meeting commemorating the 52nd anniversary of the start of Kim Jong Il’s work at the WPK Central Committee. Were these two men still at the top of the leadership heap, they would have attended the anniversary meeting. Despite that fact, both men sat in the front row of the rostrum during the SPA session (as they were at the 7th Party Congress), a sign they are at peace (or had at least assented) to their new status. Tae Jong Su was a close aide to Kim Jong Il, particularly as the hereditary succession and transition planning unfolded during 2009. In June 2010, Tae was appointed director of the WPK General Affairs Department which is responsible for document delivery and administrative housekeeping tasks within the WPK Central Committee apparatus., eventually becoming a WPK Secretary and alternate member of the Political Bureau. Tae traveled to China with KJI in 2010 and 2011. In 2012 he became Chief Secretary (now called chairman) of the South Hamgyong WPK Provincial Committee. Those officials are WPK Vice Chairman and intelligence boss Kim Yong Chol, Chairman of the South Pyongyang WPK Provincial Committee Pak Thae Song and General Federation of Tade Unions of Korea boss Ju Yong Gil. Pak Myong Chol was a close aide to Kim Jong Il and had close social ties to Jang Song Thaek. Pak held a number of positions in the regime, including NDC Councilor, Minister of Physical Culture and Sports and Chairman of the DPRK Olympic Committee. In 2009, Kang appeared alongside current WPK Vice Chairman for International Affair Ri Su Yong (a.k.a Ri Chol) to testify about and defend the DPRK’s implementation of the Convention of the Rights of the Child. Like his father before him, Kim Jong Un needs an older generation from which to solicit advice and to which he can pay the proper filial deference in the same way that Kim Jong Il had the 1st revolutionary generation.